Paul Gauguin has one of the most extraordinary biographies of any artist. His family's exile to Peru when he was just three years old was the start of a colorful and adventurous life that included being a sailor, Parisian stock broker, art collector, laborer, artist and self-styled cast out in Tahiti. Gauguin's works are hugely influential in the history of modern art, helping to spawn some of the most important artistic movements of the 20th century. Gauguin's life is also so interesting because in emulating the life of a savage (literally and artistically), he traveled further than any other artist from the reaches of urban Westernization in pursuit of this goal. Paul Gauguin was born on June 7, 1948, the son of a journalist from Orleans and a mother of Peruvian Creole descent. His family moved to Lima, Peru in 1951, and returned to France four years later. This time without his father, who had died en route. Gauguin enlisted to be a sailor in the merchant marine at the age of 17 and spent six years sailing around the world. After his mother's death in 1867, the family's legal guardian, Gustave Arosa, got him a position as a stockbroker. Arosa also introduced him to Mette Sophie Gad, a Dane who would become his wife in 1873. 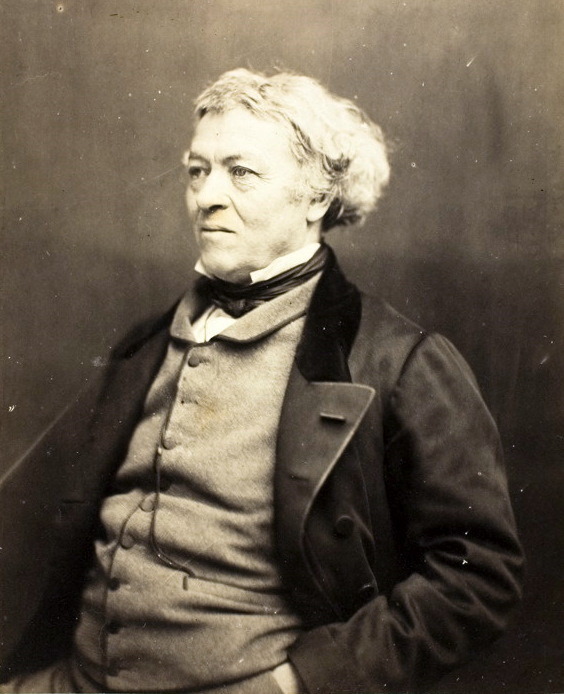 It was Gustav Arosa's collections of art (a collection which included the works of Corot, Delacroix and Millet) that first piqued Gauguin's interest in painting. With his friend Emille Schuffenecker, a fellow stockbroker, Gauguin began to receive lessons and paint. In 1876 Gauguin's Landscape at Viroflay was accepted for an official annual exhibition in France, the Salon. Gauguin's early passion was for Impressionist paintings and between 1876 and 1881 he held in his personal collection artworks by Manet, Cezanne, Pissarro and Monet among many others. 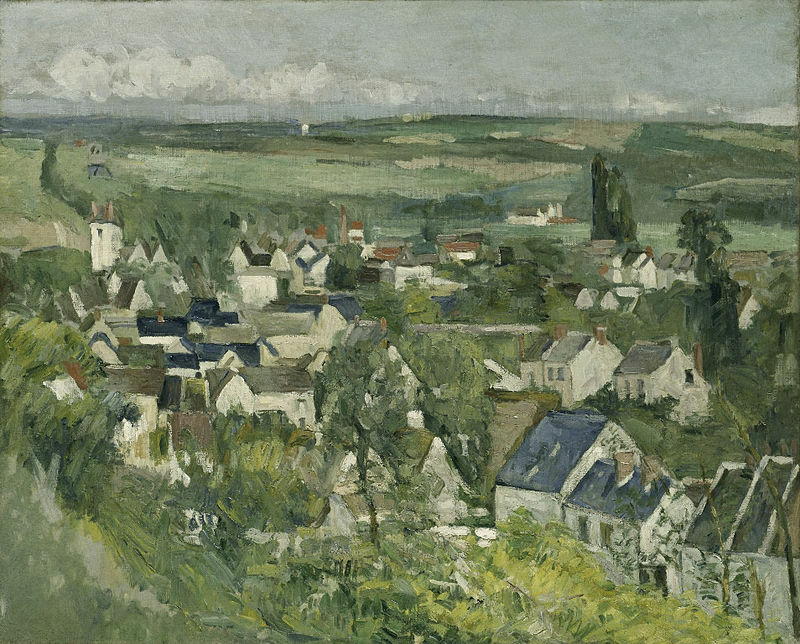 Gauguin studied under Pissarro from 1875 on, and at first struggled to master the techniques of painting and drawing. In the years 1880-82 he was included as part of an Impressionist exhibition and became a part of the social circle of avant-garde artists including Manet, Degas and Renoir. After the French stock market crashed in 1882, Gauguin used this opportunity to become a full-time artist. However, being unemployed and unable to support his family, he took them to his wife's relatives in Denmark, where he abandoned them to return to Paris the following year with his eldest son. 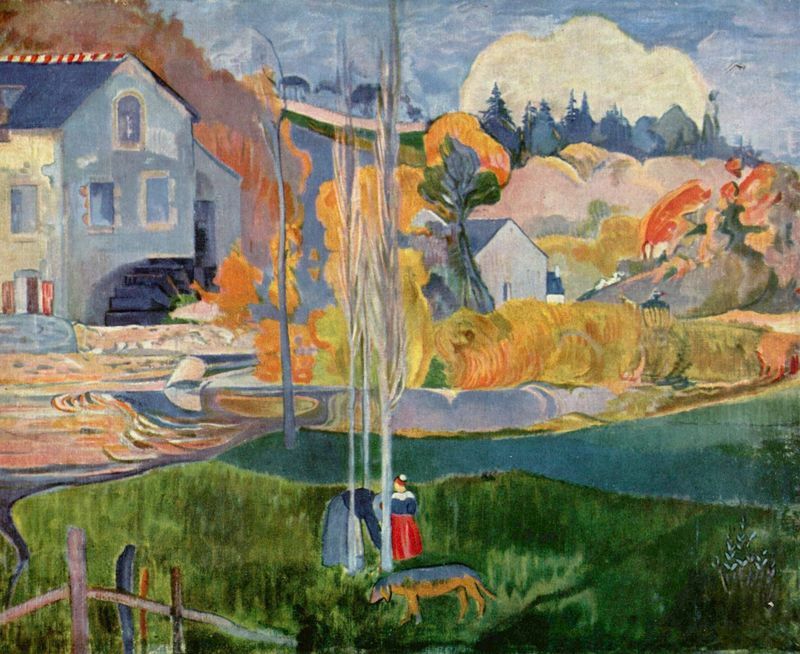 Unable to generate any enthusiasm for his own works, frustrated and destitute, Gauguin traveled to Pont-Aven in the Brittany region of France in search of a simpler, more frugal life. After a difficult winter in Pont-Aven, he left for Martinique with Charles Laval, holding the intention of living like a savage. He returned to France in 1887, affected by an element of primitivism in his own character and art. 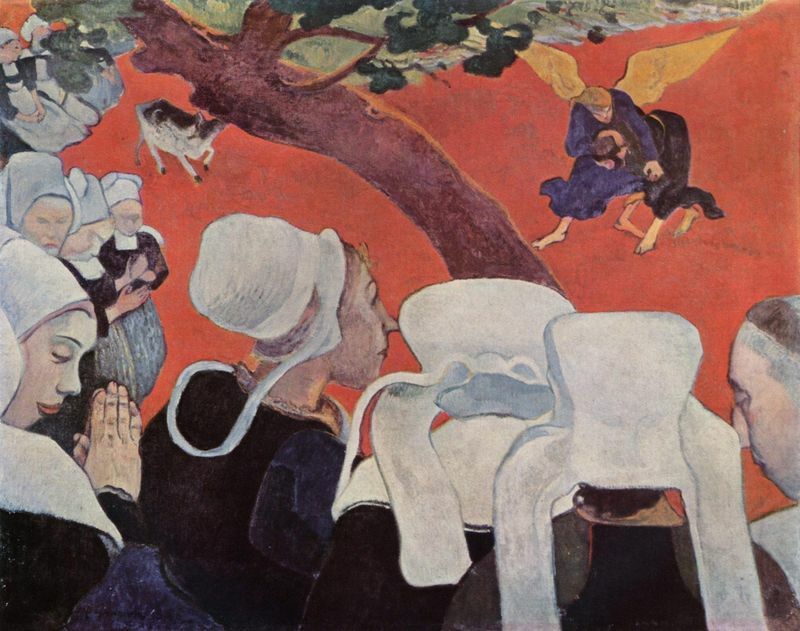 When Gauguin returned to Pont-Aven, he was joined by a host of young artists (whom he mentored), including Emile Bernard and Paul Serusier. These artists were looking for a deeper expression in their painting, more akin to primitive art. Gauguin described his style during this period as Synthetism, which included formal elements with the emotions that they conveyed. His most symbolic work of this period was Vision after the Sermon. In October 1888 Gauguin traveled to Arles, in the south of France to stay with Vincent van Gogh. This was partly as a favor for Theo Van Gogh (Vincent's brother) who agreed to represent him as an art dealer. After arriving in Arles, the two temperamental (often explosive) artists clashed in heated exchanges about art's purpose. It would be these clashes that precipitated van Gogh's threatening Gauguin with a razor and then cutting off his own ear. 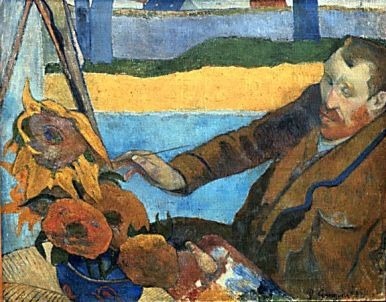 For the next few years, Gauguin lived in both Paris and Brittany. However, after finding Pont-Aven ruined by tourists, he relocated to the remote village of Le Pouldu where he focused on raw expression and developed an interest in the ancient monuments of religion. Dreaming of a further isolated location in which to work, Gauguin applied for a grant from the French government to travel to Tahiti. Paul Gauguin arrived in the Tahitian capital of Papeete in 1981. Initially disappointed by the impact of French colonization there, he attempted to discern and immerse himself with more traditional aspects of the culture. This is seen in the sculptures and woodcuts he created during this period. After painting prolifically for a year, Gauguin returned to France with a body of work he believed would bring him popular and critical adulation. It wasn't to be, howeve, and his one-man exhibit at the gallery of Paul Durand-Ruel was met with little acceptance. 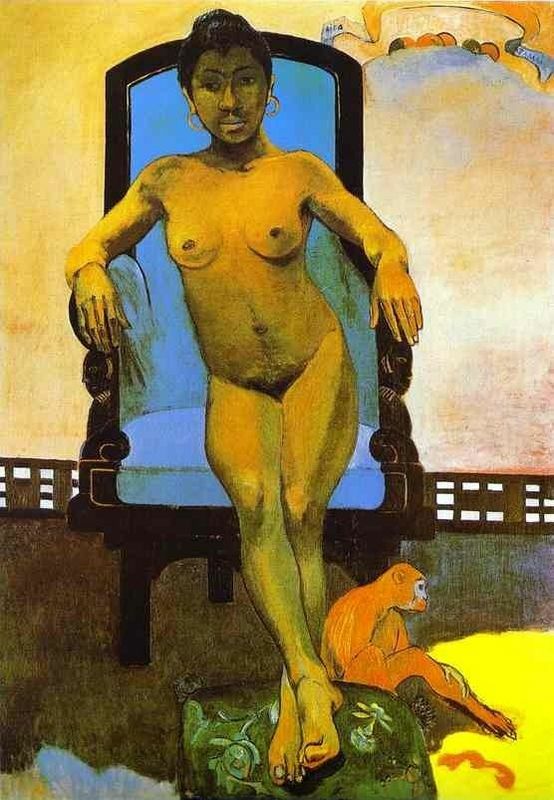 During his return stay in France, Gauguin was more eccentric than ever, typified with his scandalous affair with a woman known as 'Annah the Javanese'. He returned to Tahiti in 1895. This time he moved to an even more remote environment, purchasing land and building a home that would be called The House of Pleasure. By 1902 advanced symptoms of syphilis restricted his mobility, leaving him to concentrate on drawing and writing. He died alone in The House of Pleasure on May 8, 1903. Annah the Javanese Breton Eve Hina Tefatou Aka The Moon And The Earth Landscape in Brittany: the David Mill Madame Mette Gauguin in Evening Dress Maruru Nevermore Night Café at Arles Portrait of van Gogh Sacred Spring: Sweet Dreams Self-Portrait Spirit of the Dead Watching Tahitian Landscape Tahitian Women The Market Gardens of Vaugirard The Swineherd Brittany Two Breton Women on the Road Vision after the Sermon Where do we come from? What are we? Where are we going?